SecretBuilders Builder Logs: Need Super Shills? Go to SecretBuilders School! Need Super Shills? 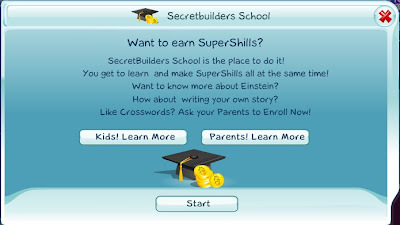 Go to SecretBuilders School! Hi Guys :) I hope you had a really nice weekend! Many of you have been asking me on SecretBuilders or on Facebook for Super Shills. The thing is - you're not going to appreciate them as much if you don't earn them yourselves, trust me! 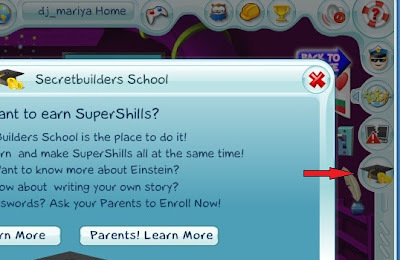 If you really could use some extra Super Shills, I suggest that you enroll in SecretBuilders School! It really is fun, it will keep your brains going (great for the summer), and, of course, you'll make Super Shills in return for your knowledge and efforts. Some of you had never heard of SecretBuilders School and asked me where it is. Do you see the screen shots above? On the right side of the first screen there is a red arrow, which points to a button with a graduation cap and some loose Super Shills. If you click it, you'll see the second of the messages above. Yes, you will need the help of your parents to sign up. It is a very simple process, so don't hesitate to ask a parent to do this for you. Why not right now? I am sure that once you've signed up, you'll make a great progress and you'll be rewarded accordingly. I know you'll make me proud! Please, share your achievements with me whenever you come to my parties or on Facebook and Twitter. You could friend me on Facebook (look for Mariya SecretBuilders) and follow me on Twitter @DJ_Mariya.